Flood defences erected to protect Bangkok have saved the capital city from floodwaters that have wreaked havoc to some outer suburbs. Thailand's prime minister Yingluck Shinawatra was confident that the situation was improving because the floodwalls were holding up against the country's worst flood in a half-century. Efforts to divert water to spare the capital from the floods, that has already killed at least 381 people and affected millions, were being made by building temporary dikes around the inner city. As runoff water from the north pushed through on its way to the Gulf of Thailand, the country's government was still battling to save Bangkok. The network of dykes defending against Bangkok's main Chao Phraya river broke down in at least two neighbourhoods as a record high tide pushed up from the gulf, filling the streets with floodwaters. Holidaymakers affected by the floods should check their travel insurance documentation to see how to claim back costs. 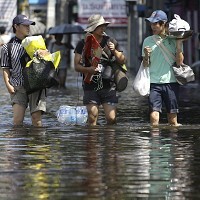 Ms Shinawatra has asked the residents to be "confident" as waters were receding from many inundated areas of Thailand. She said that although there may be overflow into some areas, it would not cause any great damage. She added: "We will recover soon."